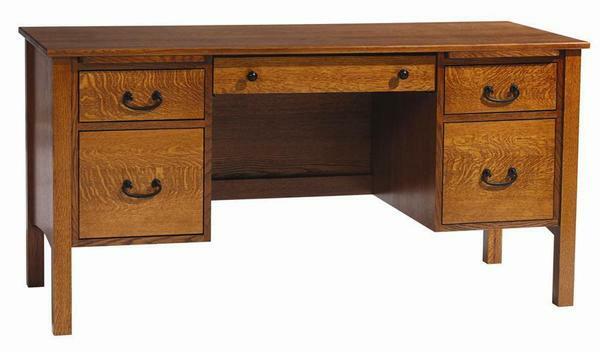 The Amish Rivertowne 60" Desk is equipped to handle a business or home office workload. This lovely solid wood desk features two hanging file drawers, two storage drawers and a central pullout drawer to house your laptop. Legs are squared and sure on this well made Amish desk and all the little details like full extension drawer slides and dovetail joints contribute to durability you can count on. The Rivertowne measures 60" wide and 24" deep and is shown here in quarter sawn white oak wood with a Michael's cherry stain. With a flat unfinished back, this handcrafted executive desk is meant to sit against a wall, but If you want it to be visible from all angles and out in the middle of the room, you can upgrade to a finished solid wood back that looks great from all angles.